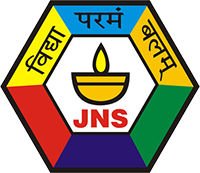 Jamnabai Narsee School, situated in the western suburbs of Mumbai, stands tall as a premium educational institution of international standards in India. We provide quality education, right from the Pre – School to the Indian School Certificate (ISC) examination. Besides offering the Indian Certificate of Secondary Education (ICSE) curriculum, the school facilitates schooling through the National Institute of Open Schooling (NIOS) at the secondary level. The aim of the school is to develop well rounded individuals, who are eco-conscious and will grow up to be global citizens with humanitarian values. The school motto "Knowledge is Strength Supreme" is succinctly encapsulated in its school emblem through the symbol of the lighted lamp at the centre of the hexagon. This motto is the driving force in the school's pursuit of academic excellence. A desire to achieve excellence in all areas of endeavour. Respect for all forms of authority and for fellow students. Concern for the needs of others, and consideration for the less fortunate. Awareness of the environment and of their responsibility to conserve it. Knowledge and appreciation of India's cultural heritage with a special emphasis on the culture of the community in and around the school. Empathy, with the spirit to embrace global diversities. Readiness to face fearlessly all the problems and challenges which tomorrow's world will bring them.